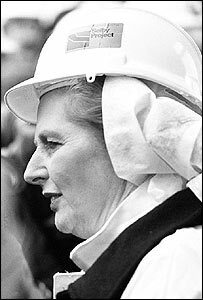 Margaret Thatcher visiting Wistow colliery, Yorkshire, in 1980. Margaret Thatcher was the nemesis of the trade union movement. Together with miners' leader Arthur Scargill, she managed to destroy the power of the trade unions for almost a generation. Only now, more than 13 years after her departure, are they beginning to find their feet again. To understand the scale of what supporters called her achievement, others call her shameful legacy, it is important to look at the impact of the unions in the 1970s. It is difficult to comprehend today how much power union barons like the then miners' leader Joe Gormley and transport union boss Jack Jones wielded in those days. There were endless strikes afflicting the Post Office, steel industry, the ferries, steelworks and much more. There was also "Red Robbo", the union leader Derek Robinson who repeatedly brought car and truck-maker British Leyland to a standstill in the Midlands. Labour ministers courted union chiefs; Conservative governments were humiliated by them. It was a particularly galling situation for the Tories. When Ted Heath tried to take on the unions from Number Ten he suffered a string of indignities, including the three-day week. In 1974 he foolishly decided to fight an election on the question "Who governs Britain?" The voters answered by installing Labour's Harold Wilson as prime minister. Heath's defeat led to the arrival the following year of a little-known right-winger, Margaret Thatcher, as leader of the opposition. Her rise coincided with a spreading belief that union power was getting out of hand. She recognised that ordinary people, among them many trade unionists, were fed up with incessant strikes and walkouts. Then in 1978 Labour Prime Minister James Callaghan made the political miscalculation that would put his party out of office for a generation. Rather than hold an election later that year, he decided to soldier on to the following spring. Thanks to the delay, his government ran into the now legendary "winter of discontent". It ran through the first three months of 1979; its effects lasted far longer. Public sector workers were out on strike for weeks. Uncollected mountains of rubbish piled high in the cities, Green Goddesses were on the streets, and bodies remained unburied. The latter happened in one city, Liverpool, but became an emblem of the chaos inflicted on the public by the unions. It was disastrous for the government. Labour had always been able to present its close relations with the unions as an asset that allowed it to deal with them effectively; that relationship had now become a liability. 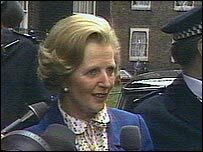 At the May 1979 election Mrs Thatcher squeaked into Downing Street with a 30-seat majority. Her economic policies helped weaken the unions. The recession of the early 1980s saw manufacturing, the main area of union strength, shrink by half while unemployment soared to over three million. Union membership plummeted from a peak of 12 million in the late 70s to almost half that by the late 80s. She appointed her henchman Norman Tebbit as employment secretary. Though a former leader of the BALPA pilots' union, it was a job he relished. He set about stripping the unions of their legal protection. Flying pickets, the shock troops of industrial warfare, were banned and could no longer blockade factories, ports, public bodies and much more during disputes. Strike ballots became compulsory. The closed shop, which forced people to join a union if they were seeking employment in a particular trade, was outlawed. But Maggie still wanted a showdown with a major union. She got her wish in 1984 when the battle mode she had recently adopted for the Falklands conflict was directed towards a new combatant: Arthur Scargill, who led his loyal troops into the trap she set. As she famously - and controversially - framed the dispute at the time, "We had to fight the enemy without in the Falklands. We always have to be aware of the enemy within, which is much more difficult to fight and more dangerous to liberty." 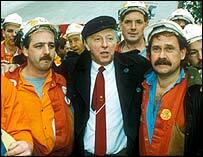 Mr Scargill gave her strategy a boost when he called a national pit strike without a ballot. As a result, Nottinghamshire miners - who opposed the strike but would have supported one had a ballot backed it - continued working. They kept the power stations going and the lights on, and eventually broke away from the NUM. Mrs Thatcher ran the campaign against Scargill as if it were a military operation. Subsequent energy secretaries, Nigel Lawson and Peter Walker, had built up massive coal stocks. Striking miners and working miners' groups were infiltrated by MI5. Large numbers of police were used to keep the pits open, leading to set-piece clashes like the battle of Orgreave. But there was one moment in the Autumn of 1984 when Mrs Thatcher almost lost her bottle. The NACODS pit deputies were preparing to join the strike, which would have closed the Nottingham coal field. She offered a peace deal to Scargill, but he refused to take it. His loyal deputy Mick McGahey admitted privately: "Arthur has won and he doesn't even know it. He will destroy this union." He was right. The deputies' strike didn't happen. The miners lost, returning to work humiliated in 1985. The unions went into steep decline, having seen the lengths to which the state was prepared to go to vanquish them. They lost their power, influence, millions of members and a large swathe of their rights. Most trade unions loathed her; but she remained utterly convinced of the need to cure the nation of what had become known as the "British disease", strike fever. Head to head: Was it inevitable? Can the UK coal industry survive?